You know what I love about Thursdays? There is so much anticipation for Friday and the weekend that I end up looking forward to them almost as much as Friday! They're great because I don't have to make coffee for the morning since I treat myself to SB's on my way to work and I don't have to do any dinner prep for Friday because it's date night!! Bottom line, Thursdays are a relief! Sorry for the absence of an AIGH post today! I'll get back on track next week! 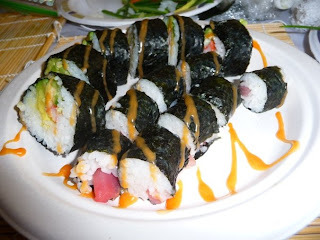 Hope it comes out looking as tasty as these! In bowl, mix milk and cereal. Allow cereal to sit in milk for 5 minutes. Add bouillon, onion, and eggwhites. Mix well, then add turkey. With clean hands, mix it all up, and divide into 6 burgers. They will probably be a little "wet" - I prefer to cook on my grill pan. Cook both sides evenly and enjoy! I sometimes add a little shredded cheese and top with fresh avocado slices for some extra pizazz! A little blurb on the small things that have made me smile this week! ~ After cleaning out our closet a few months back, I realized it was time for some new shoes. Comfy flats to be exact. So, I have begun my collection:) In addition to the purple ones I showed you last week, I've also bought these! I've already grown attached to my cute new bag! ~ Finally, as I got home today I was walking past our balcony and noticed how big our "honeymoon tree" has gotten! This time last year it had about 6 big leaves, but when the weather turned cold we lost them. I was a little worried it wouldn't come back, but this summer has done wonders for our little plumeria tree! I hope this week has treated you well! Mine started out rough with a really difficult day at work yesterday, but I'm now feeling great and back to my cheery self:) Chris cooked dinner for me last night! What a lovely treat! Don't get me wrong, I love to cook, but sometimes it's nice to sit and watch a meal be prepared for you, especially after my Tuesday! Anyway, turkey burgers are on the menu for tonight and I'm straying from my trusted Clean Eating recipe and trying these Cooking Light Fajita Turkey Burgers. I'll let you know how they turn out. And while I'm straying from familiar favorites, instead of my usual drinks from Starbucks, today I got a tall skinny caramel latte. Yummy! And only 90 calories:) Just goes to show you that sometimes, change is good! Good night and pleasant dreams! 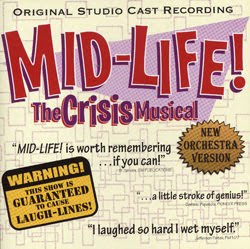 Mid Life the "Crisis" musical: Absolutely hilarious! Although I should tell you I was by far the youngest person there, and the show was my idea! It was held at a really small theatre and had a very local feel to it, but all in all, well worth my Friday night! 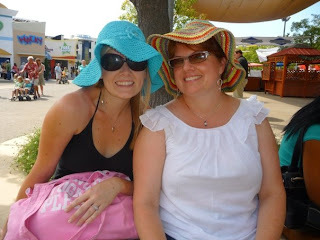 State Fair: What can I say? 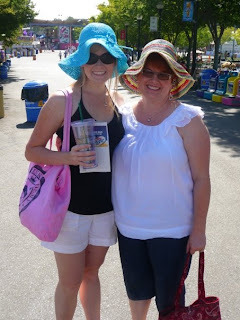 The fair always seems to meet my expectations and this year was definitely no exception! 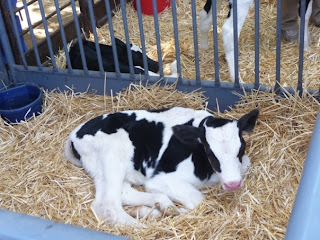 I don't know what it is: the food, the exhibits, the cute little animals, the new products for sale in the expo, the general merriment and crowds of people enjoying themself? It's probably a combination of it all for me. And this year, opening weekend had gorgeous weather! Some would still call it hot, but the low 90's is pretty good for mid-August and considering we have been in the 100's lately! And probably the most exciting news I've got today is that my ACSM study materials came this weekend! I know I'm gonna let my inner nerd come out here, but I don't care! I am ridiculously excited to start studying!! It feels like I'm starting school again. And depending on how you view that, you're either jealous or you think I'm completely crazy:) You see, the beginning of a new school year was always very exciting to me. Peeking through my new books before my first class and embarking on an adventure of learning new things, especially when I got to college and was learning things I was particularly interested in! Although the information isn't new to me, studying for this new certification means I am taking a step forward for my career! That gets a double yay! I have even set up a study schedule to keep myself on track. And I'm going to tell you all now so I can have some accountability, I am planning on taking the test the week of October 12th. And now that you know, I have no excuse for slacking! 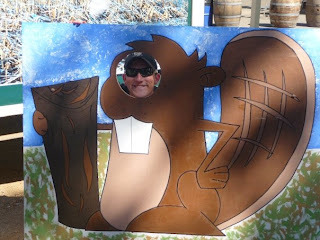 My husband or a beaver? Getting ready to watch Splash Dogs! Abby totally could have been in this show! 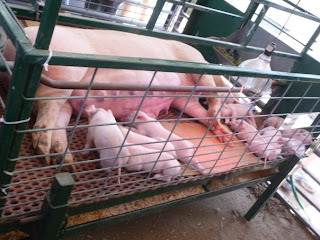 And newborn pigglets! Why are they so stinkin' cute?! 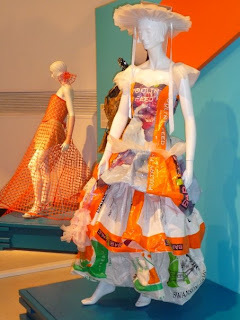 Awesome dress made out of animal feed sacks. Crazy! 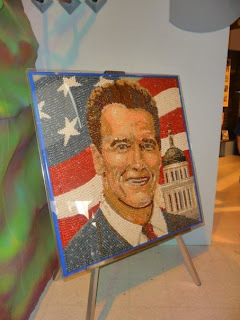 And of course Arnold made out of Jelly Belly's...naturally! Oh the crazy things we see! 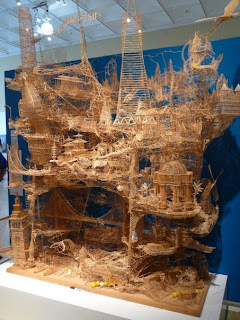 This is a replica of San Fransisco made out of hundreds of thousands of toothpicks!! Who does that?! 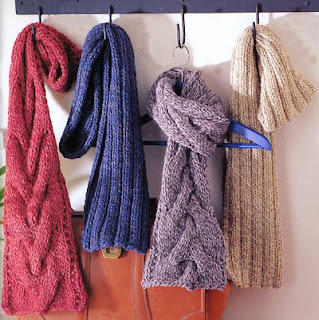 After the Fair, Can it be Fall? We made it to Friday! I love fridays for many reasons, one being that I stop for coffee in the morning:) It's like a little reward for making it through another week in one peice! 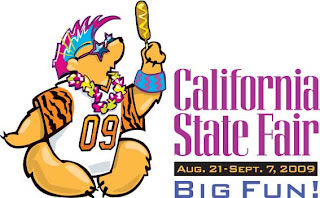 And on Saturday we are going to the California State Fair! Yippee!!! I love the fair and look forward to it every year. I just can't believe it's that time of the year already! As I was telling Chris about this post, with much enthusiasm I might add, he seemed puzzled at how baking had anything to do with health. And just as I shared with him, I shall pass on this new fabulous find to you! 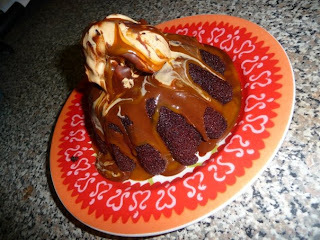 It is no secret I love two seemingly contradictory things; health/fitness and desserts! No matter how hard I've tried to will myself to find a deliciously moist piece of banana bread unappetizing, I just can't do it. It goes as far back to being a little kid when my parents would put me to bed and then I'd hear my dad open a box of Ho ho's. I would then convincingly call, "Daaaad, are you eating something?". And reluctantly, one of my parents would come to my room and agree to let me get up for another 10 minutes and have a few sweet bites. While I like to believe that my taste buds are a bit more refined as an adult, I am still that little girl calling out when I smell a freshly baked pastry:) Of course, now that I have a strong understanding and conviction about eating mostly good, nutritionally dense food, I find myself with a dilemma between my head and my inherited sweet spot for treats. Over the past few years it has occured to me that instead of trying to dispell desserts from my diet all together (and believe me, I've tried! ), it may be better to seek out more healthy options. To my great success, I have accumulated many tasty and crowd pleasing alternatives to traditional recipes, such as my PB&J cookies:) Of course, before I approve a recipe, it is a must that taste is not compromised. Because afterall, if it doesn't taste good, why waste the calories?! Plus, it wouldn't make my husband too happy! So this brings me to my recent find that has just got me in a great mood. 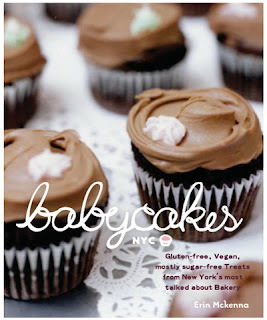 It is a little thing known to many New Yorkers as Babycakes, a bakery where responsible baking takes place:) By that I mean that this bakery stands by a promise to prepare their cupcakes, cakes, cookies and other delightful treats with whole, natural, vegan and mostly gluten free ingredients! 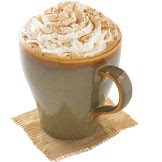 Their products are sweetened only with natural sweetners such as agave nectar and evaporated cane juice. Ahh, love! And the best part is, if you are not fortunate enough to live in NYC and enjoy these little treats, you can buy the cookbook and make them yourself! This book has got me so excited! It makes my day that somebody else believes desserts don't have to be saturated with refined sweetners, white flours and unhealthy fats. For now I will be perfectly content with making my own Babycakes creations, but one day I will visit this brilliant little bakery:)Check out their blog to the right! Oh, I read last week they just started making doughnuts!! What happens when you combine two perfectly succulent salmon steaks with some Asian-inspired ingredients? 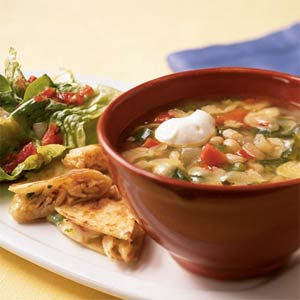 You create a wonderfully simple and healthy meal, of course! We were given this delicious salmon on Monday by Chris' grandpa who just got back from a fishing trip. Yep, he caught it himself! For this oh-so-simple dinner I didn't fuss with complicated ingredients. I just used some pantry staples. Place steaks (4 oz. each) in an oven safe dish, then pour the mixture over the fish. Cover the dish with a lid (or aluminum foil in you don't have a lid). Place in the oven and cook for 15-20 minutes. Voila! I served this with a side salad and couscous. I tried to keep the rest of the meal simple since the main course had so much flavor and garlicky bite! Got any other reading suggestions I can add to my constantly growing list? Hi friends! I'm back from a much needed and well, necessary blogging break. The truth is, I've missed it! The last several days have been packed, mostly with work, and it doesn't feel like anything will be slowing down soon! This week I will be working some overtime, which is good and bad. But enough with the boring stuff! 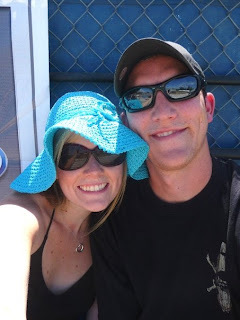 I do have some very exciting news to share! I just paid for my ACSM personal training certification exam!! My current certification is not one I'm really impressed with and I finally decided to just get the one I really want! I am feeling so inspired to start training again:) It will definitely be a nice distraction from my current full time job! This will hopefully be the beginning of a very nice transition to doing something I am passionate about again:) Yay! So here we are, it's Sunday night and I'm trying to prepare myself for another hectic week. Although, I am a little more ahead of the game than I was last week. Because my Aunt was here last week and we spent a lot of time with my family, I wasn't really home to catch up on laundry, grocery shopping, and cleaning, which made this week feel a bit more chaotic. Not that I'm complaining, as we has such a great time with my Aunt!! But now that I've had a whole weekend to catch up, I say "Bring it on Monday!". Our delicious wild mushroom bruschetta appetizer at Bella Bru! Look at that Goodness of Tiramisu! I also made a trip to Trader Joe's and picked up some favorite goodies of ours:) This Pesto Torta is oh so good! And finally, their Vodka past sauce...mmm, mmm good! Stay tuned, I've got some good posts for the week! Merry Monday! I hope your weekend was absolutely fabulous! 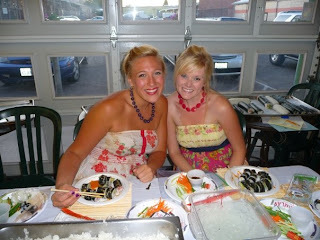 As I told you last week, my Aunt is in town and I've been pretty occupied with my family the past several days. Therefore, I think I'm going to take a little break from blogging. Just for the week, I am just growing overwhelmed with the many priorities and responsibilities on my plate at the moment! Work is absolutely horrendous now that it's peak, family in town, appointments this week, preparing to take my next personal training certification, getting in the groove of training again, and of course the good ole' everyday stuff! You know, sometimes life just happens that way:) Stay tuned though, I'll be back next week! Thanks for keeping up with us! Julie and Julia was FANTASTIC!!! I know I can be dramatic about a lot of things, but this truly was an incredible movie! Bon Appetit!! * Remember the almond croissants I told you about? Naturally, Lael took some photos of the delicious treats and I've been wanting to see the pictures. I knew my friend was talented! Here's a link to her flickr page, see for yourself:) The croissant pics are on the bottom of the first page. 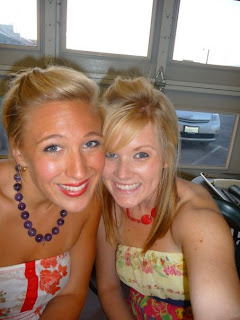 Notice the cute, green picnic table we're sitting at! 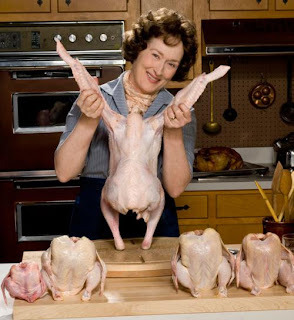 * And finally, this particular favorite hasn't happened yet, but we are going to see Julie and Julia tonight. I guess I'm counting on it being a winner:) Let's be real though, I just love going to the movies since it has become a rare treat! 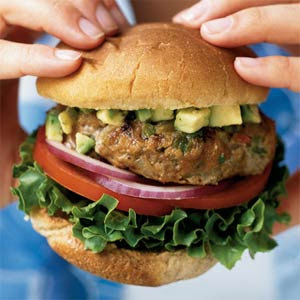 Which brings us to a total of 340 calories:) And an added bonus, you get a great balance of complex carbs, protein and fat! Bring on the feel-good energy! 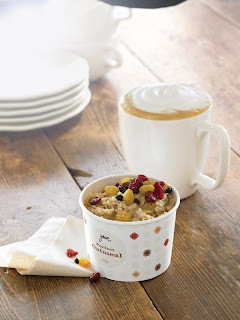 It's true, Jamba has recently come out with 18 new food items! 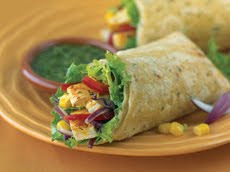 I have actually only tried the wraps and they have been quite tasty! The Chimichurri wrap was filling enough to safisfy Chris and myself, alongside a sixteen ounce Bright-eyed and Blueberry smoothie! The wraps are aroud 400 calories each, so we opted to split one since we had a smoothie as well. Each wrap comes with a dressing, which of course adds some extra calories, fyi. Jamba now also has a great variety of smoothies that have no added sugar for the dietary conscious! With my smoothie of choice and half the Chimichurri wrap, my lunch totaled 410 calories. I'm looking forward to taking more of these classes! They are such good dates, with friends and my guy! 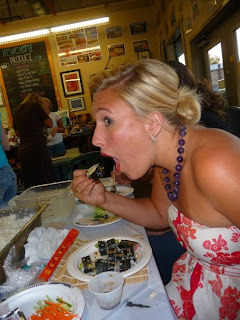 Next I want to tackle the 7 course dinner!! 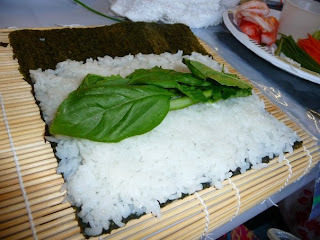 This my friends, is a green goddess roll:) Just asparugas and herbs, YUM! Our dinner, made by us! Cheers! 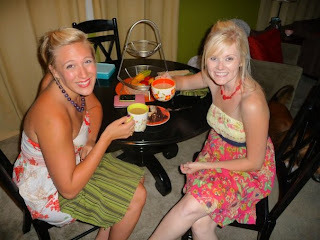 Notice my new dress I bought last weekend;)I'll take any excuse to wear a sundress! 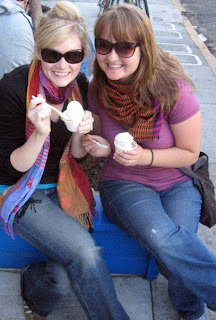 And finally, Lael and Me at Humphrey Slocumbe:) This photo curtousy of Lael. Off to a Great Month!